Drop in to speak to our experts about the unique benefits of QRILL Pet. More than your regular omega-3 ingredient, QRILL Pet is made out of only whole dried krill. The product naturally contains phospholipid omega-3s, a superior form of omega-3s for both pets and humans, marine proteins, choline and astaxanthin. No additives or preservatives are needed. 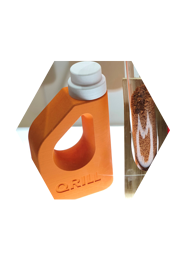 QRILL Pet is a product of Aker BioMarine, the only Marine Stewardship Council (MSC) certified krill supplier in the world. For the fourth year in a row, the Antarctic krill fishery has received an "A" rating for its well-managed krill fishery from the Sustainable Fisheries Partnership. It is well-known that omega-3 fatty acids are important for an ideal pet diet, as they have great health benefits for pets, including healthy organs, skin, and fur. Our dedicated R&D department continuously work on studying the benefits of QRILL Pet on pets. Come and learn about our latest science and dive deep into existing studies with our team. We are more than just your regular ingredient supplier. At the end of 2018, we launched the world's first long distance dog sled team, the QRILL Pet Mushing Team. Aimed at improving the sport of dog mushing, for both the furry and human athletes, we set out on a mission to create a unique foundation that will set new standard in the world of dog mushing. The team consist of five professional and successful mushers, such as 2019 Champion of Finnmark Race and Femund Race, Thomas Wærner, who will be at our booth in Bologna. Don't miss the chance to meet him in person and talk to him about his personal experiences during his many long distance dog sled races and the key to his success. Thomas will also share his ambitions for the team and the benefits of QRILL Pet for his dog team. Along with Thomas Wærner, we will have several team members from our science, marketing and sales team present at our booth. Including our newly assigned Director of Specialty Animal Nutrition Products, Tonje Elisabeth Dominguez. We will share news about our unique partnership approach on science, marketing and more. There is a lot in the pipeline, including a new supplement product for pets and the launch of our partnership portal. Zoomark 2019 in Bologna is a great place to catch up on your business plans and exchange ideas for future opportunities. We are in Hall 30, Stand B11-C12 to advise you on how our ingredient can help you to differentiate and increase the quality of your pet food formulations. Come and visit us at our brand new stand. We look forward to seeing you at the Bologna Fiera exhibition center between May 6th to 9th, 2019.